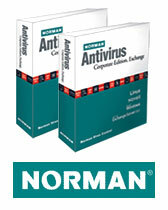 Protect Your PC with Norman Anti-virus & Internet Security £59.99. Digital Home Club members click here to Download and Activate your Norman Anti Virus Suite. In today's digital world, staying secure online is extremely important. Without taking a few simple precautions you're leaving yourself open to the dangers of viruses and prying eyes. With computer viruses and identity theft on the rise; we have teamed up with Norman and their award winning anti-virus and internet security products, to keep you safe online. Norman Anti-virus and Internet Security offers comprehensive protection against computer viruses, worms and trojans as well as hackers/crackers in one simple, easy-to-use solution. This product combines the award winning Norman Virus Control and Norman Personal Firewall in one package to offer customers complete peace of mind while using the Internet. Email scanning for computer viruses, worms and trojans. On-access scanning of files for computer viruses. Norman SandBox technology to detect both new and unknown computer viruses, including trojans and worms. Parental Control, to determine when and where your children are allowed to go on the Internet. Active content control based on sites. Automatic updates over the Internet. For Complete Protection of your Digital Home including Norman Anti Virus Security, join our Digital Home Club from just £4.99 per month - Click here for full package.